We'll be back on July 5th, after the Independence Day Holiday. Have a great weekend and God bless America. It's not often something so seemingly banal as a ZBA hearing can be described as epic. 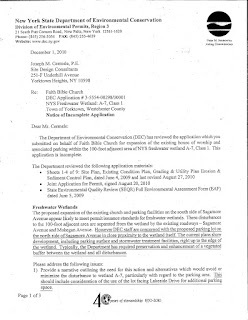 Last night FBC's application alone took 3 hours to hear and it was adjourned to August 11th, 2011. Save the date. It's still open for public comment. You can catch reruns on Channel 20, Cablevision in Yorktown. It will rerun every Thursday until August 11th from approximately 8:30pm until 11:30pm. I will be uploading portions of the hearing with commentary consistently until the next hearing. Below is one of my favorite moments from last night. 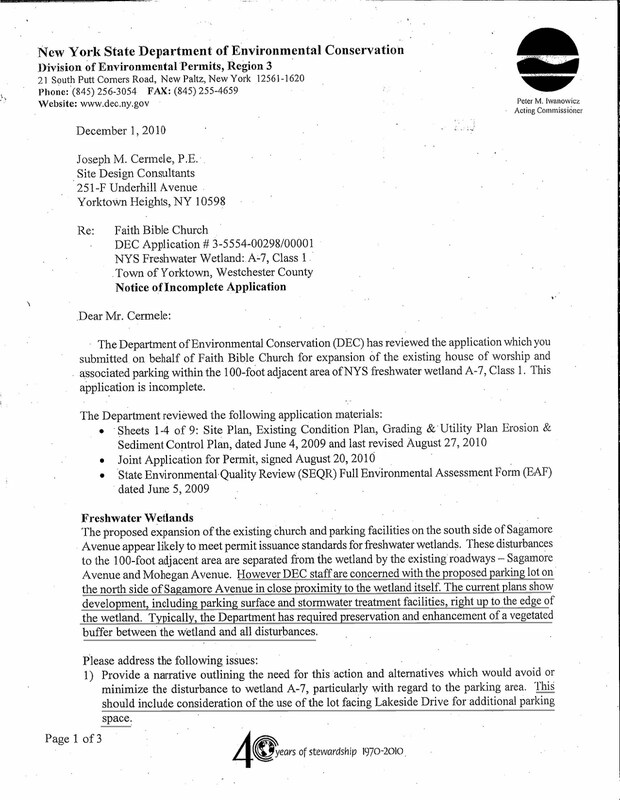 Al Capellini, attorney for the developer, backs me up and corrects the Yorktown special counsel to the ZBA and the acting chairman of the ZBA, Gregg Bucci, who didn't know the zoning had changed to require special permits for churches in R1-10 zones. At one point, Mr. Capellini rightfully notes that the law requiring the special permit was put on the books 4 or 5 years ago. 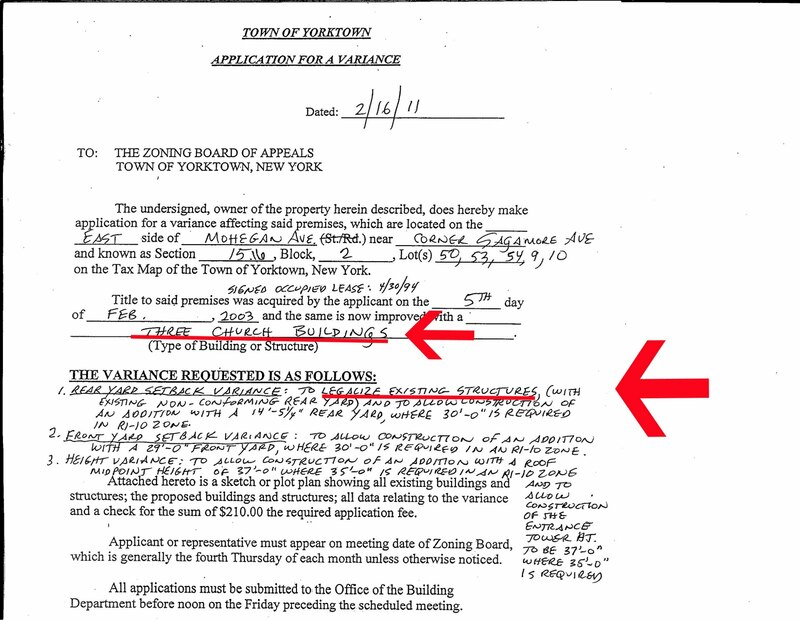 Neither special counsel, nor the board chair had a current copy of the Yorktown Zoning Ordinances. The entire Town Code and Zoning is available online and, luckily, I had a copy with me last night. I make a motion that the ZBA have a current copy of the Town's zoning on hand at all hearings. All in favor, leave an "aye" in the comment section, below. You may want to turn your speakers up, the audio is not the best. I just got myself a fresh copy of The Northern Westchester Examiner. I hope you pick it up as well and read the article by Sam Barron on page 6 outlining community concerns relative to the proposed new development. Did you know that the Mohegan Highland's Property Owner's Association is an active, not for profit corporation in New York State? It was formed on January 24th, 1930 and has it's own by laws. Did I mention that there's a hearing tonight at Yorktown Town Hall to hear FBC's proposed major zoning variances? Please note that if you plan to attend, do not rush. They've put FBC at the end of the agenda. It may not start until 9pm; to be safe though, I recommend arriving by 730. I'll be there for the whole thing though, just in case. For those who cannot attend you can watch or DVR the simulcast on Channel 20, Cablevision. I'm looking into what channel it airs on Direct TV. It's going to be a hectic week leading up to the public hearing. I wanted to mention a couple things as we kick the week off. 1) We are not opposed to the Faith Bible Church, or their right to redevelop the site. However, to redevelop the site, the applicant does NOT need major zoning variances. It's a matter of scale. There is not enough parking to support the development in its current form. Granting major zoning variances to increase the degree of non-conformity that leads to overcrowding the site is not prudent. 2) Hello there. Thanks for paying attention and getting involved in the discussion. 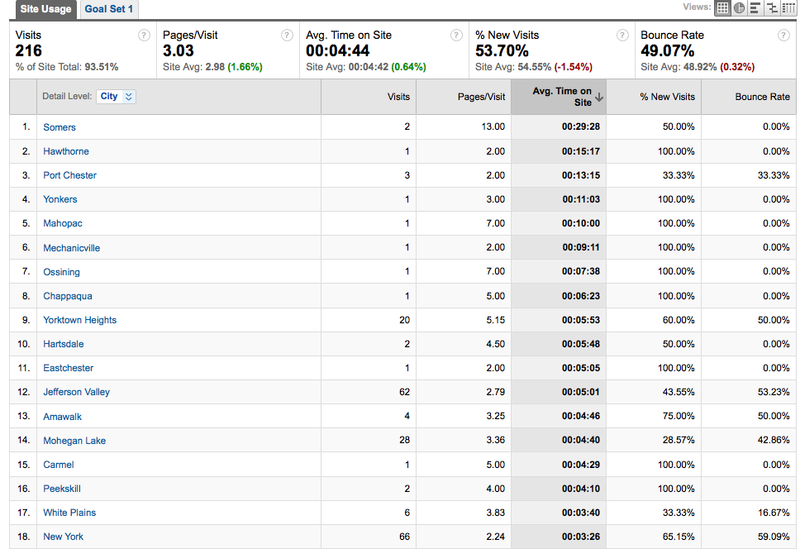 Below you will find some of the metrics for SaveMoheganLake.com for the last 30 days. Mohegan Lake had a respectable 28 unique visits with an average of 4 minutes, 40 seconds spent on the site 3.36 pagers per visit. 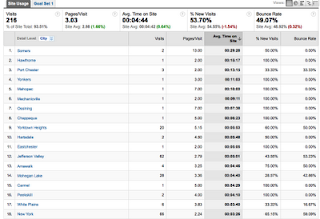 However, Somers wins the the paying attention prize with an average time of 29 mins, 28 secs, with 13 page views per visit; impressive. Leave your name in the comments and I'll email you a gift certificate to Auggie's Prime Cut. Perhaps the large swath of land being cleared toward Lakeside Drive will be used as a recreation area for the new, proposed occupancy for a school for a 172 people? 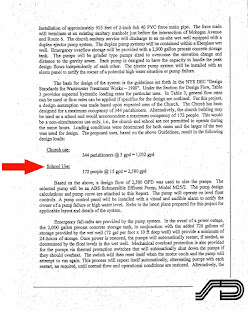 Based on the sewer design criteria the school would be able to operate daily (I'll get to the sewer issues, shortly). Mohegan Avenue is already deficient in clear width--not to mention sidewalks--to accept the added traffic load to support such an operation. Mohegan Avenue runs directly through the outfall of Mohegan Lake. This spring it was actually shut down by State Trooper's for about a week because the lake and wetland merged and the road was under more than 2 feet of water. Without significant upgrades to the existing road infrastructure, it is irresponsible to approve such a major new development. Click on the image below to view Site Deign Consultants' engineer's report for FBC. Not much has been discussed about the new school use. It's important to note that a school has never been established as a legal use or occupancy. The current legal occupancies and uses are two single family residential homes and small house of worship. We can glean some details in the Youtube video below. Below: A couple details from Site Design's tree inventory plan. Looks like that 55,000sf of woodlands they need to clear and grade will come within about 15 feet of Lakeside Drive. Wow. It's unclear what that area will be used for. Though as we've noted previously, preserving steep slopes in single family neighborhoods is one of the duties of the Planning Board. Below: Those are the 12 trees they are required to inventory before they kill because they are over 7 inches in diameter; at least I believe that's the threshold. Many more trees and vegetation will have to be killed to make this new development happen. I object to the major zoning variances because they will increase the degree of non-conformity. The bulk, height, area, an lot coverage will all be increased substantially if these variances are approved. Please note that the applicant correctly dropped the phrase "legalization of existing structures" from the application. It now reads "construction of a building." There's a major difference how zoning laws will be applied to a new building as opposed to an existing structure. There are existing structures that do not conform to zoning currently. Some have argued they are "legal non-conforming," I disagree because the non-conformity is for a single family home, not ancillary church uses. The State's environmental concerns have disappeared from the Town's Planning and Conservation Boards' records for the FBC application. 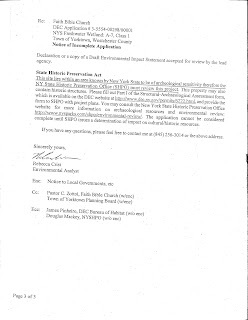 I have a request in with the NYS Department of Environmental Conservation engineer who is reviewing FBC's application. Their most recent comment to the applicant came in the form of a 3 page "Notice of Incomplete Application." 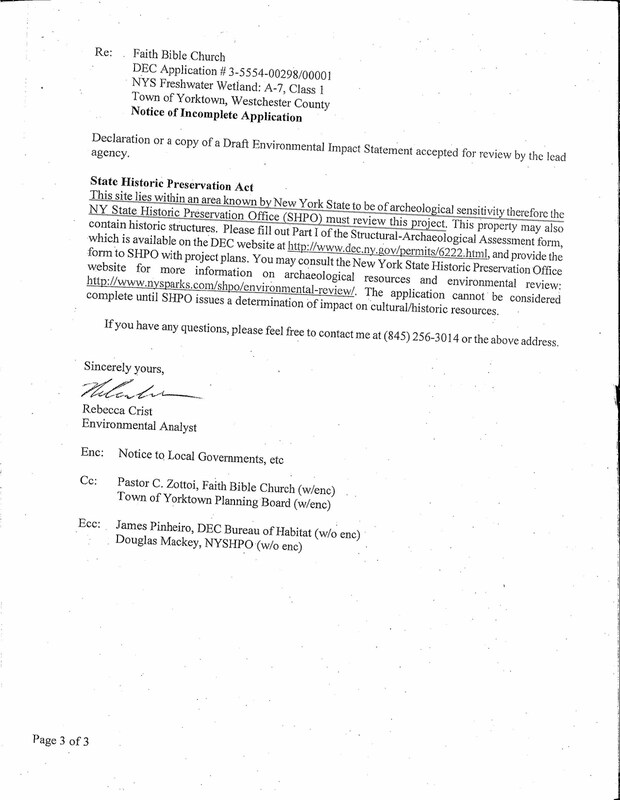 In Yorktown Planning and Conservation Board records, only pages 1 and 3 are present. Since page two would seemingly have nearly all of the recommendations, it is imperative that Yorktown's files be made whole. I hope that serious errors and omissions do not become a recurring theme with this application. The DEC is concerned with the wetland parking area. We are also. Considering the applicant is proposing 27 cars to be parked on this lot and in light of the fact that the applicant consistently uses the same lot for about 40 cars already[! ], it's hard for me to contemplate how more than tripling the legal occupant load of the current development while decreasing the actual amount of parking makes any sense. It's especially disturbing that the applicant is the one who paved the wetlands in the first place. Now they are taking credit for returning it to an impervious state? I believe that would be considered buttering your bread on both sides and completely contrary to our environmental laws. I will share page two of the document below as soon as it is made available. At tonight's Planning Board working session, it was confirmed by Joseph C. Riina of Site Design Consultants of Yorktown and Albert A. Capellini, Esq. (former Yorktown Town supervisor) that the developer did not notify several of the legally interested parties of their previous application for 3 zoning variances (2 major and 1 minor). This was cited as the reason for the revocation. Mr. Capellini basically stated that the applicant didn't know that they owned property that had frontage on Lakeside Drive. It's a steep hill, but, seriously? There is a survey in the file that clearly labels "Lakeside Drive." Sadly, they also confirmed that the retaining walls proposed under the new zoning board application with 5 variances (3 major, 2 minor) were not new and were actually a part of the original application [note: the two additional variances are compounded in that the 10 foot encroachment into a required 12 foot side yard will also be nearly 3 times the legal limit for a retaining walls]. Retaining walls will be used to level an incredibly steep hill-- a hill the town is charged with preserving; oh, and did I mention the parking lot and retaining walls requiring MAJOR variances are replacing a single family house? We are up to 3 major variances and 2 minor to make this happen; that's a 3 fold increase from what was presented about 3 months ago. That means that these preeminent professionals either missed, or intentionally omitted the two biggest zoning variances. It should be noted at this point that the project could move forward with no variances whatsoever. Therefore, it's disturbing that the developer is proposing such radical deviations from laws enacted to preserve the few remaining low-density, single family neighborhoods and the steep slopes that make them so unique. What amazes me, personally, is that the developer's team repeatedly cites the unique slope of the site and the challenges that it presents, but not a single section through the hill exists; please do share. Add to that, the near dismissal of the "interested parties" (that's a legal term and refers to you, Lakeside Drive) in the ZBA application are the ones most affected by the proposal and I'm scared. The Planning Board ultimately recommended the application be heard by the Zoning Board of Appeals on June 23rd at Yorktown Town Hall @ 7:30pm. We can make ourselves heard; if we don't, my family and tax dollars are out of here. I'll donate my house (immediately adjacent the development) to the church for parking. At that point we'll have solid precedent for giant retaining walls encroaching 90% into required rear yards in Mohegan lake and they'll be able to provide the parking to sustain this monstrosity. Below is an outline of the 3 criteria that the Town Code requires the Zoning Board must find to grant approval of a variance. Let's discuss. "(1) That there are special circumstances or conditions, fully described in the findings of the Board of Appeals, applying to the building or land for which the adjustment is sought, which circumstances or conditions are peculiar to such land or building and do not apply generally to land or buildings in the neighborhood." Click on image to view the code. I think we call all agree that all of the lots and the buildings that sit upon them are all a bit peculiar; since that holds true for the entire neighborhood of Mohegan Lake, then peculiar is the norm and this criteria of variance approval is not met. "(2) That, for reasons fully set forth in the findings of the Board, the aforesaid circumstances or conditions are such that the particular application of the regulations of this chapter would deprive the applicant of the reasonable use of such land or building and the granting of the adjustment is necessary for the reasonable use of the land or building, and that the adjustment as granted by the Board is the minimum adjustment that will accomplish the purpose. " The "adjustments" the variance, as currently worded, would have a severe impact to the neighborhood; classifying these adjustments as minimum would be a farce. Encroaching 14.5' into a a required 30' rear yard (please note that this yard is the side of the property that become very steep and requires the most disturbance of the environment)? Building a 12' high retaining wall that will literally require the removal of tons of rock and earth (mostly rock) in a zone that allows retaining walls of only 4.5'? Remember, that one of the town's goals is to preserve "steep slopes?" I wonder if that's the same retaining wall that requires a variance to be set back only 2' where 12' is required. Why even have zoning laws if a variance that nearly eliminates a required setback altogether is found to be a minimal adjustment of the said laws? The developer is allowed to build as of right, meaning requiring none of the major variances. Why should these severe, high-impact variances be granted? They shouldn't. "(3) That the granting of the adjustment will be in harmony with the general purposes and intent of this chapter and of the Town Development Plan, if such exists, and will not be injurious to the neighborhood or otherwise detrimental to the public welfare." "The Town Development Plan" does exist in the form of the "Comprehensive Plan," and this proposal flies in the face of the spirit of the goals outlined in the Plan to preserve Mohegan Lake. This is whole other post (stay tuned), but suffice it to say that approving these reckless deviations from the law will not only be detrimental to the neighborhood and public welfare, but also the environment. Don't forget: Zoning Board hearing regarding the developer's proposal is open to the public on June 23rd at 7:30PM. Please consider the following: the Town Code describes the "intent and purpose" of the board's duties(see below). The developer's new zoning variance adds two new major variances; one of them nearly triples the legal limit for retaining walls allowing them to carve out a flat area on the steepest slope in the entire hamlet of Mohegan Lake! Just ask the residents who can't get their vehicles up the hill in winter and have to park on the community's wetland parking; it could be argued that this is not the developer's land--it belongs to the community of Mohegan Lake. The emphasis on a few words below, is mine. 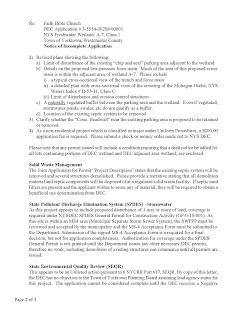 The Town Board hereby finds and determines that in order to protect and safeguard the health, safety, welfare and quality of life of the Town of Yorktown and its residents; protect wetlands, water bodies, habitat areas, steep slopes, and other sensitive areas from encroachment; protect drinking water supplies, including both reservoirs and aquifers; protect and enhance the community character of residential neighborhoods; and protect the visual quality of scenic corridors, as well as key scenic vistas; it is necessary and proper to preserve significant remaining areas of open space throughout the Town of Yorktown. The Town Board further finds and determines that in endeavoring to accomplish said goal it will be most beneficial to have the advice and assistance of a committee of residents from throughout the Town who can formulate an open space preservation plan, advise on the Town's preservation efforts, identify open space preservation opportunities, form tactical plans and generally provide advice regarding open space preservation matters to the Town Board. I'm not sure if the last sentence refers to the committee that developed the Comprehensive Plan for Yorktown, but it may very well apply to the staunch defenders of the Mohegan Lake Community. See you June 23rd at 7:30PM at Town Hall. 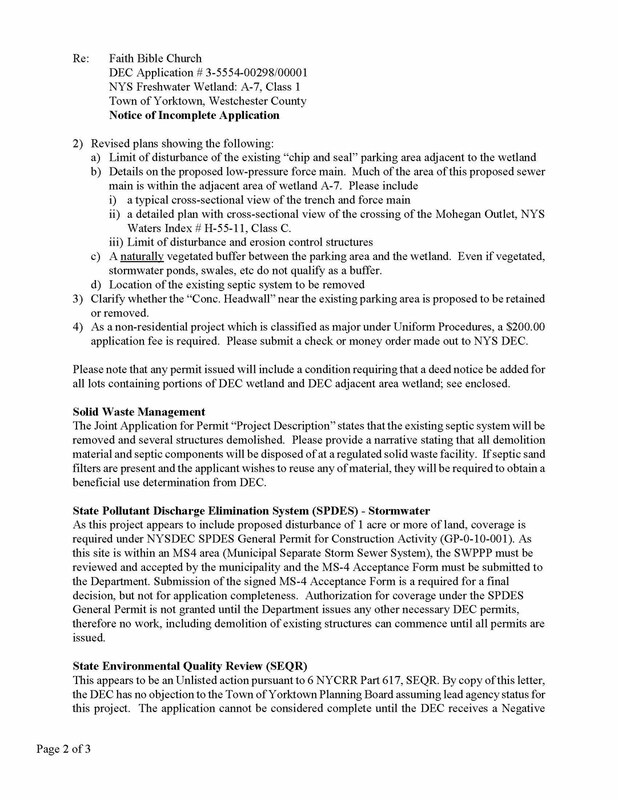 A new application will be presented the Yorktown Zoning Board of Appeals on June 23rd, 2011 at the Yorktown Town Hall building. Be there or be square. It's a new application in that there are two additional variances . My question: was a design change made that warranted the additional variances--major variances, I might add--or were these variances present in the first iteration of the plans and omitted? If it's the latter, it would be hard for me not to believe that the deficient notifications to many of the legally interested parties, plus the omission of two major variances, may have been an attempt to fly in under the radar--so to speak. Let's give them the benefit of the doubt and I'll reach out to the developer's attorney as recommended in the closing of the letter below; I'll keep you abreast of their response. 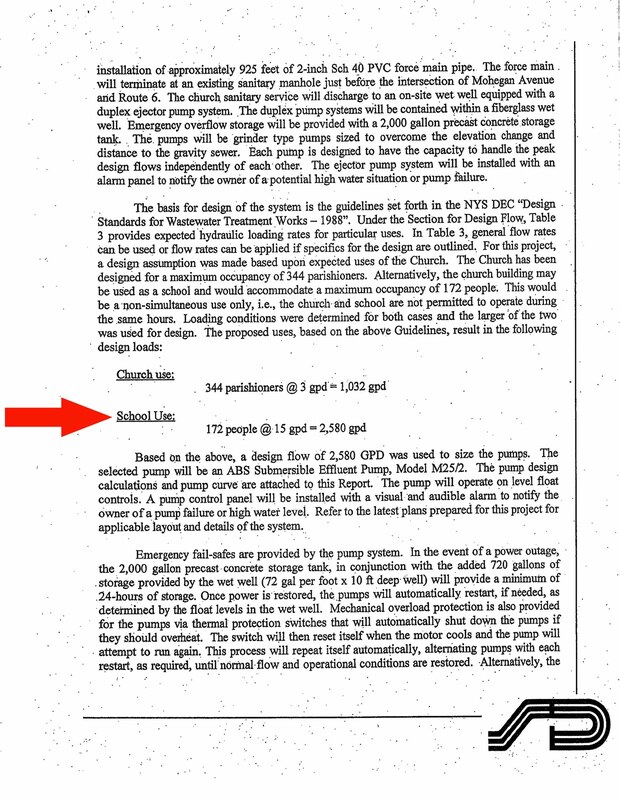 Click on the image below to read variance "22" that proposes a retaining wall on the easterly side of the site [that's you, Lakeside Drive!] that would be almost 3 times the legally allowed height allowing them to carve out a huge parking lot; I bet they encounter rock that requires blasting. The other variance is 6 times the legal limit for a retaining wall setback in a side yard. Harrumph.